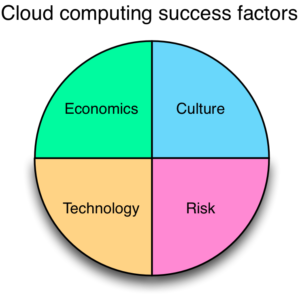 Succeeding with cloud computing requires incorporating your organization’s unique economic, cultural, risk, and technological considerations. Success with cloud computing means adopting more than just technology change. It requires addressing the elements that make your organization unique: how you work, the risks you’re prepared to take, and the market in which you sell. Even a tailor with all the right supplies – several yards of fabric, a sewing machine, and an iron – needs to craft a garment that looks good, is of high quality, and is done in an efficient manner. Here are the key ways to incorporate your organization’s economic, cultural, and risk factors into your adoption of cloud computing and accelerate your success. Understand the business impact of the services that will run in the cloud. Only by understanding the business impact of each service will you be able to properly prioritize regular and emergency work on those services. Increase capacity with demand. Demand will change over time, so success with cloud requires that your services adjust their use of compute power accordingly. Measuring the demand is the first step toward this goal. Decrease capacity as demand wanes. Don’t keep around inventory that just sits gathering dust – get it off your balance sheet. Note that decreasing capacity with demand can seldom be done effectively with a self-hosted or private cloud. Act strategically. No business goal ever achieved itself – it requires concerted effort by people collaborating toward a shared goal. Give people the context they need to understand the shared goal. Support change. 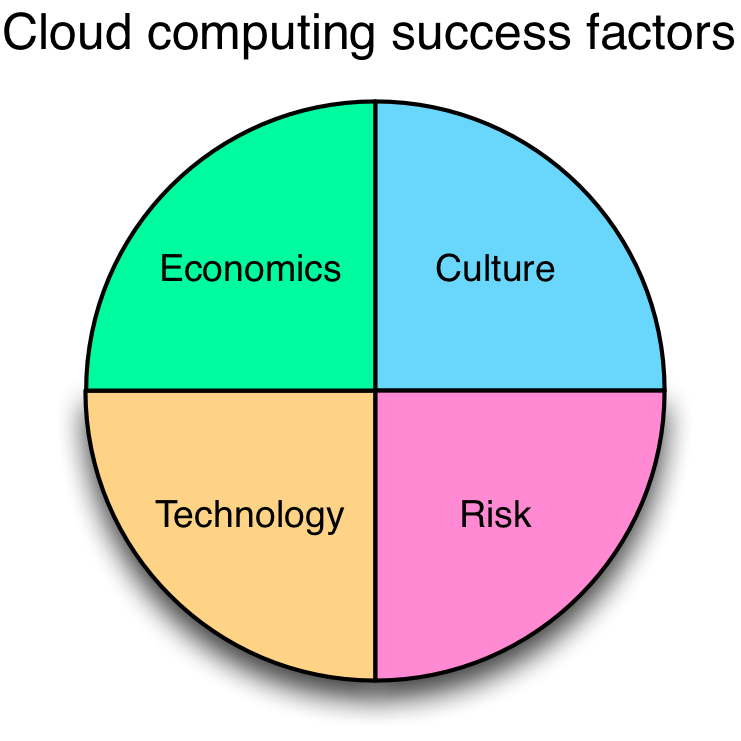 Cloud computing enables organizations to adjust their use of computing as requirements change. Encourage your organization to adjust and adapt to change. Make it easy to access all your organization’s data. When change comes along, the data will need to be juggled in new ways. Hire and partner with only the most trustworthy. As risks materialize, your business will rely on these trusted people to maintain normal operation. Regularly assess all assets and access points for risk. Look especially diligently into automating work processes so they utilize “blessed” configurations. Create a single source of truth for authentication and authorization. Whereas other data in your business need not be immediately consistent, authorization and authentication should be, in order to avoid the split-brain, he said she said phenomenon. Treat all processes as elements in a single value stream: service delivery. With all component activities in the delivery process focused on this result, collaboration and integration between disparate teams is vastly improved. Utilize small, standardized, compassable elements. Standardization and simplicity is the key to operating at scale. Build systems that expect failure and act reasonably despite it. When change comes and failure happens, your systems will be able to cope reasonably. Succeeding at cloud computing means looking beyond the technology and incorporating your organization’s economic, cultural, and risk factors.